CATCH THE BUZZ – Sulfoximine-Based Insecticides May Harm Bees as Much as Those They are to Replace. A new class of pesticides positioned to replace neonicotinoids may be just as harmful to crop-pollinating bees, researchers cautioned Wednesday. 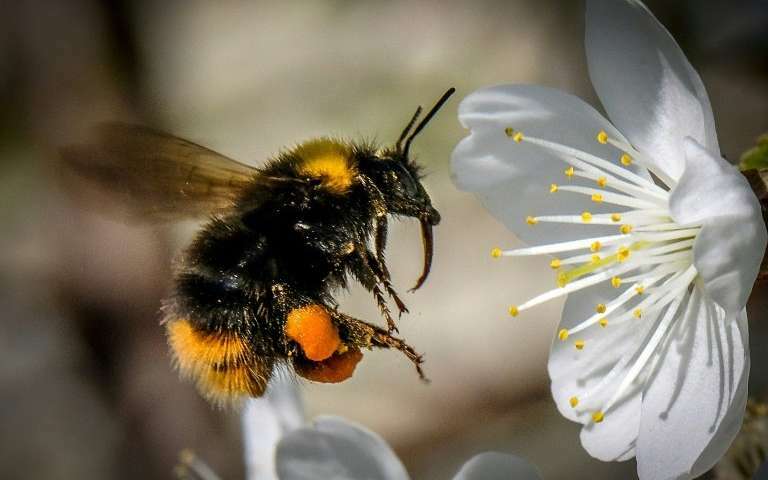 In experiments, the ability of bumblebees to reproduce, and the rate at which their colonies grow, were both compromised by the new sulfoximine-based insecticides, they reported in the journal Nature. Colonies exposed to low doses of the pesticide in the lab yielded significantly less workers and half as many reproductive males after the bees were transferred to a field setting. “Our results show that sulfoxaflor”—one of the new class of insecticide—”can have a negative impact on the reproductive output of bumblebee colonies,” said lead author Harry Siviter, a researcher at Royal Holloway University of London. As with neonicotinoids, sulfoxaflor does not directly kill bees, but appears to affect the immune system or the ability to reproduce. Foraging behaviour, and the amount of pollen collected by individual bees remained unchanged in the experiment. The study has been published amid legal challenges and shifting national policies on neonicotinoids, among the most commonly used insecticides in the world. In April, European Union countries voted to ban three neonicotinoid-based products in open fields, restricting use to covered greenhouses. Earlier this month Canada followed suit, announcing the phase-out of two of the pesticides widely applied to canola, corn and soybean crops. Neonicotinoids are based on the chemical structure of nicotine and attack insect nervous systems. Sulfoximine insecticides, while in a different class, act in a similar way. Unlike contact pesticides—which remain on the surface of foliage—neonicotinoids are absorbed by the plant from the seed phase and transported to leaves, flowers, roots and stems. They have been widely used over the last 20 years, and were designed to control sap-feeding insects such as aphids and root-feeding grubs. Past studies have found neonicotinoids can cause bees to become disorientated such that they cannot find their way back to the hive, and lower their resistance to disease. Other research has shown that crop pests have also built up resistance. “Sulfoximine-based insecticides are a likely successor and are being registered for use globally,” Siviter noted. Sulfoxaflor is also registered in Argentina, Australia, Canada, China, India, Mexico and a couple of dozen other countries. Experts not involved in the research praised its methodology and said the findings should sound an alarm. “This study shows an unacceptable scale of impact on bumblebee reproductive success, after realistic levels of exposure to sulfoxaflor,” commented Lynn Dicks, an Natural Environmental Research Council Fellow at the University of East Anglia. Conducting such research should be a “mandatory requirement” before pesticide companies bring such products to market, he said. Fears have been growing globally in recent years over the health of bees. Pesticides have been blamed as a cause of colony collapse disorder along with mites, pesticides, virus and fungus, or some combination of these factors. The United Nations warned last year that 40 percent of invertebrate pollinators—particularly bees and butterflies—risk global extinction.